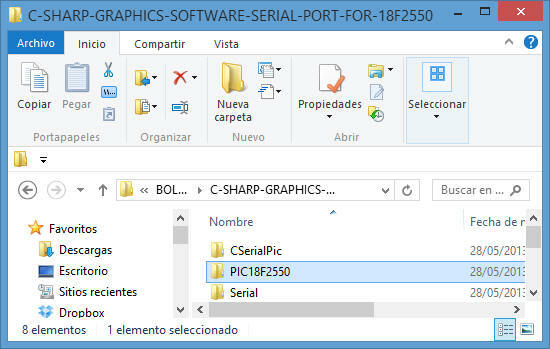 project: C Sharp visual software for remote control of Bolt 18F2550 system through the serial port. C# (C Sharp) is a programming, object oriented language, developed and standardized by Microsoft as part of its platform .NET, which was later approved as a standard by ECMA (ECMA-334) and ISO (ISO / IEC 23270). Its basic syntax is derived from C / C + + and uses the object model .NET platform, similar to Java, but includes improvements from other languages. The name C Sharp was inspired by musical notation, where '#' (Sharp) indicates the note C is a semitone higher, suggesting that C # is superior to C / C + +. This project has 2 parts: the software developed in C Sharp that runs in any Windows computer, and the firmware developed in ANSI C that runs in the Bolt 18F2550 system. Both programs interact with each other to make a nice and easy to use remote control application. 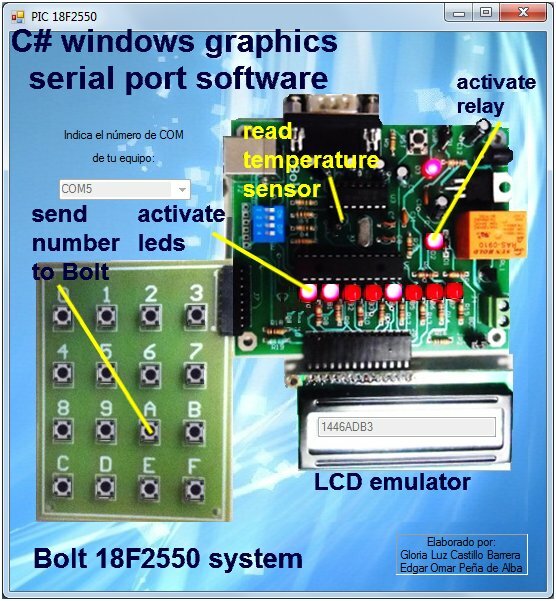 When using the C# software, the user will be able to work on a visual interface: the photo of the application window shown above, permits the user to click on different devices (any of the 8 leds, relay, microswitches, temperature sensor, any of the 16 buttons of the keypad) to send remote commands from the PC to the Bolt 18F2550 system through the serial port. All source files of the C# software and firmware are provided so that interested developers may make use of them for future or special projects. You will first need to transfer the following ANSI C .hex firmware to the Bolt board: Serial3.hex For this purpose, use software Bolt v.1.0.1. 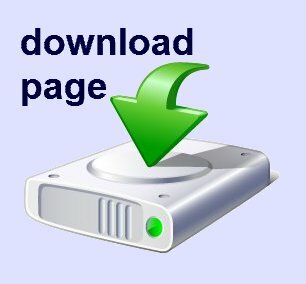 Download .zip file from the link provided in the bottom of this page. Install C# software in your PC or Laptop executing application file CSerialPic. 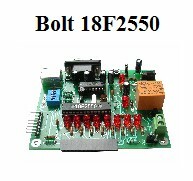 Connect the devices as shown in photo below, with the Bolt 18F2550 board with its LCD inserted. You may use an external wall transformer to power board and test the relay or you may also use a USB cable to power board, but then you won't be able to test the relay. 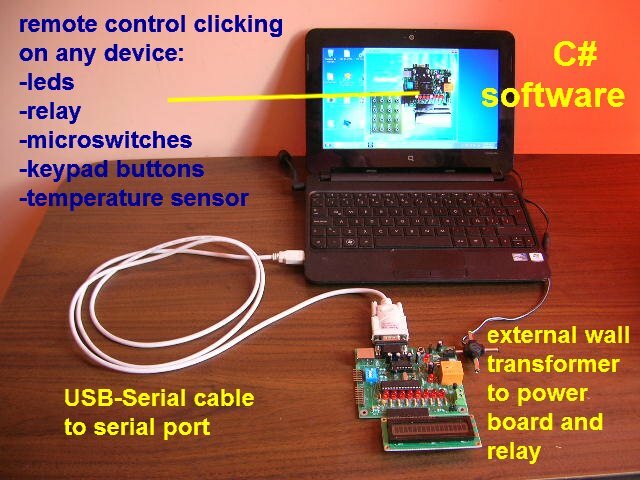 To connect board with the PC computer, a USB-Serial cable (with its driver installed) may be used. It is also possible to use an older PC with a DB9 connector and a DB9-DB9 cable to connect the Bolt board with the PC. Once the C# program is running, by clicking over each device in the application window, user may activate-deactivate remotely any of the 8 leds and the relay in the Bolt 18F2550 board, or read remotely its microswitches or the temperature sensor. Commands may be also sent by clicking on any of the 16 buttons (0..F) of the hexadecimal keypad in photo. 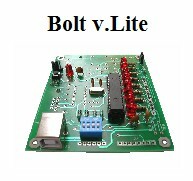 A complete testing of the Bolt board may be performed using this software. Please download firmware and software programs from the link below.